Home » Dr. Slick XBC Mitten Scissor Clamp 5"
Dr. Slick XBC Mitten Scissor Clamp 5"
No finger loops here! Simply squeeze the clamp all the way through the ratchets to release. To close, squeeze until the ratchets lock. Extremely popular alternative to the traditional loop and ratchet clamps. This versatile tool features a serrated scissor mounted behind the jaws for cutting tippet/leader material, trimming flies streamside or opening that pesky bag of jerky. 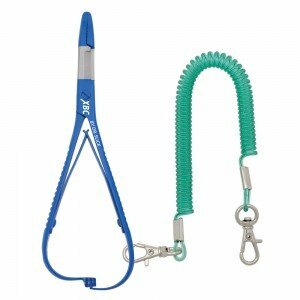 Comes with hook eye cleaning pin in jaw, dual self-opening springs and a full-swivel bungee lanyard. Make it your main squeeze!